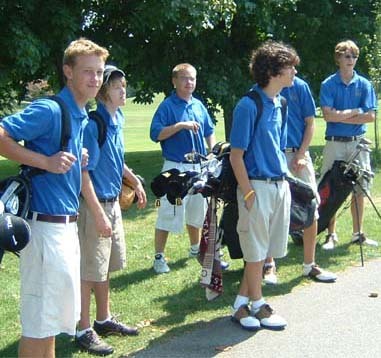 8-31-05 18Holes Frankfort & Leland 9 holes Away 4:30 pm Report Match Medalist was OHS's Jordan Pomeroy shooting a 44. Freshman Levi Capper turned in a 46! Josh Cebula scored 55 and Parker Johnson a 57 for a team score of 202. Also shooting, but not factored into the score were Todd Lyman with 58 and Drew Griswold with 61. 9-1-05 9Holes Mesick Schools Home 4pm Playing on the front 9 at The Heathlands ,Freshman Levi Capper shot a 44 to be Onekama's lowman for the day. Jordan Pomeroy shot 47, Josh Briggs 53, Todd Lyman and Parker Johnson each a 56. Only one of the 56's was used for the four scores that produced the team effort of an even 200. Tim Veverica came in with a 58, Josh Cebula 68, Cody Sievert 70. Kristie Sievert was also out there for the Portagers today, but pulled off the course after about the 5th hole due to time constraints. Not her fault or her playing partner from Mesick, just so many players involved, play became slow and the teams had to let paying customers play through adding extra delays.Match medalist was Mesick's Dan Casselman with a 38. Brad Hall shot 43, Eric Kearnf 49, and Jessie Revolt 49 to make a team score of 179 and the win for Mesick.The Portagers are taking the weekend off, however Coach Zadow doesn't doubt one bit that the team members will be out golfing somewhere anyways..:) The team now stands 2-3 Overall and still 2-0 in the WMD. 9-8-05 Manistee & MasonCC Away 4pm Photos and Results Mason County Central won the match with a team score of 161. Manistee High finished with a score of 173. OHS now stands 2-1 in the WMD and 2-6 Overall. 9-13-05 MCE & Walkerville @ BearLake Away 1pm The rain quit and the storms held off just in time for the matches to start, but the wind was still a force to be reckoned with. OHS played Custer on the front nine and Walkerville on the back nine at the Bear Lake golf course. These were WMD league matches. Struggling with the wind on the front 9, the Portagers finished with a team effort of 207 to Custer's 195. Levi Capper and Parker Johnson each carded 50 to be low men for this match for OHS. Jordan Pomeroy shot 51 and Drew Griswold 56 to round out the scoring four. Josh Briggs shot 57 and Tim Veverica a 58. Custer's lowman, Chris O. shot a 43. On the back nine, against Walkerville, our Portagers shot their best team score of the season! Freshman Levi Capper carded a 43 to become yet again lowman for the team. Jordan Pomeroy handed in a 46 as well as Hunter Slade a 46. This was Hunter's first competitive match and he proved his abilities well!. Parker Johnson turned in a 49 to round out the scoring the four and team effort of 184. Drew Griswold shot a 54 and Tim Veverica a 57. Walkerville turned in a team score of 200 giving OHS the win. Knowing the previous consistent scoring of our young team members in the low 40's, Custer can be beat this year. They will get another chance to prove just that soon enough. The team now owns 3rd place in the conference by themselves. They are 3-2 in the WMD and 3-7 overall to date. 9-21-05 WMD Jamboree @Manistee National 1pm Photos and Results OHS's 4th place finish today on the front 9 on Canthooke Valley puts them in a tie for 3rd in the WMD. Team placings are as follows: 1st MCE with 176, 2nd Brethren/BL 180, 3rd Freesoil 185, 4th OHS 191 and Walkerville 5th with 200. 9-28-05 District Golf Match Onekama's Golf Team had 2 members Qualify for Regionals this week. Junior Jordan Pomeroy and Freshman Parker Johnson were the 3rd and 4th ranked individuals at the District Meet. As a team the OHS crew finished with a 397 team effort for 7th place, just 12 strokes out of the hunt for regional team competition. Only 6 teams will go onto Regionals this year as well as the 6 lowest scoring individuals outside of the team competition. This is the first year that the golf teams have actually had a District competition. Normally, they would have all had Regionals, then qualifying teams and individuals move on to State. Districts were played out at Colonial Golf Club at Hart. Jordan and Parker will travel to Cedar Springs for Regional play on Oct. 6th. Jordan qualified with his 96, Parker qualified with his 98, Levi Capper shot 101, Todd Lyman 102 to round out the scoring four and team effort of 397. Drew Griswold turned in a 108. Keep in mind that Parker, Levi and Drew are Freshmen! Just outstanding play coming from these guys! Levi had led the team as lowman several times throughout the season and while not making Regionals must have been disappointing for him, it was reported that he commented," I have next year". This just shows the class our team members have. While it's a shame that one match on a certain day is the one that sends you on to regionals and state, it doesn't take away all that these Freshmen have accomplished this year! Conference Championship to be played out at The Heathlands on October 4th. Currently the team stands tied for 3rd place in the Conference. Oct. 7 Cedar Chase Golf Course Jordan Pomeroy shot 91 and Parker Johnson shot 97 at regional action held at Cedar Chase Golf Course in Cedar Springs, Michigan on Thursday, October 7, 2005. Neither score qualified for play at State. Think this does it for the 2005 playing season. Gwen will attend our golf dessert next week at which time the team will receive their individual and team awards. She will probably have pictures then. Our Portager Golf team is excited that summer brings the start of their sport! The team members have already been hitting the courses on their own once the snow left and will continue to fine tune their skills on their own until they can meet with Coach Zadow as a team, when practice can officially start August 11th., following the MHSAA Rules. The Golf teams are allowed 16 contests and the schedule is full. This year the Conference Tourney will be held on their home course, The Heathlands, which brings added delight to the members. The Portagers only lost one Senior to graduation, with the bulk of the team coming back as Juniors. These highly seasoned veterans of the game of Golf (2 who were All Conference last fall), are sure to lead the team through another outstanding season for the Portagers. The team has already picked up another player and will gladly add more to the roster. Their season starts before school opens next fall ,so now is the time to make contacts if you are interested in being on the Golf Team. For more information please contact Coach Zadow or any Golf Team member! Until then, Hit them Long and Straight! And when your season starts officially, Hit them even farther!